A piece of one of history's great puzzles falls into place when Kirk's crew comes across the S.S. Botany Bay, an old-style, pre-warp sleeper ship from Earth that contains several bodies in stasis. Amongst these bodies is Khan Noonien Singh, a genetically engineered strongman and one of the great leaders of Earth's Eugenics War of the 1990s. Although he disappeared without a trace then, once Khan is aroused from his long sleep he soon reveals the ambition, strength and intelligence that helped him conquer a quarter of the Earth. Once aboard the U.S.S. Enterprise, Khan quickly befriends the beautiful Lieutenant Marla McGivers, the ship's historian who has a passion for strong-willed leaders. 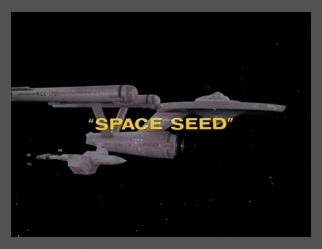 Together with his Botany Bay crew and new companion, they seize control of the Enterprise by capturing the engine room. Before it's too late, Marla has great misgivings about her newfound loyalties. With her help, Kirk and Spock regain control of the ship by flooding it with gas. Khan's men are soon overtaken and a due punishment is meted out. Khan and his crew, including Marla McGivers, are exiled to a planet where they must start life anew. McCoy taunting Spock a bit. I'm glad this part of history didn't come true. At least . . . not yet anyway. history might be right, just off on the timing. Khan is a real smooth talker. Khan has amazing powers of manipulation. to do anything he wants. Oh boy, what a crop indeed. Check out Star Trek II: The Wrath of Khan.